NIIT is leading Global Talent Development Corporation, dedicated to IT education. They offer learning solutions to Individuals, Enterprises and Institutions across 40 countries. 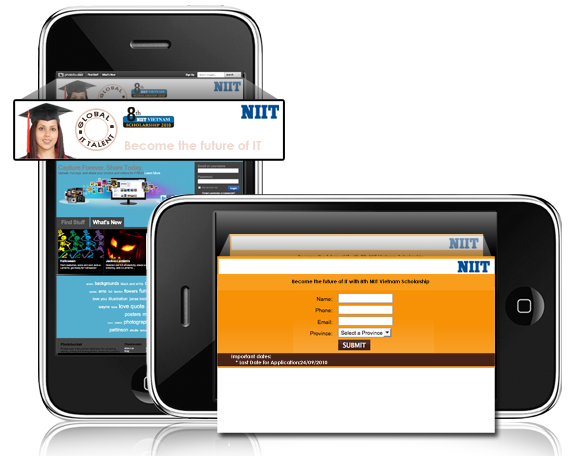 With the assistance of Percept Knorigin, NIIT saw an opportunity to leverage mobile advertising to drive awareness and generate leads for their schools. campaign was developed to promote their 8th annual scholarship program. Display ads were run across number of mobile devices. The ads linked to landing page, which contained simple lead gen form. InMobis AdROIt (Advertising ROI Technology) was deployed to track results post-click and continuously optimize the campaign to maintain ROI.